Portrait o Jacques Cartier bi Théophile Hamel, ca. 1844. No contemporary portraits o Cartier are kent. First European to travel inland in North Americae. Claimed Canadae for Fraunce. 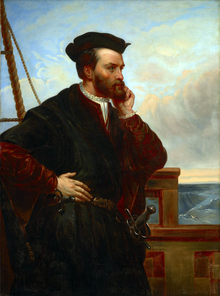 Jacques Cartier (31 December, 1491 – 1 September, 1557) wis a French traider an splorer that is thocht o as ane o the major discoverers o Canadae, or mair speceificlie, the inner eastren region that wad acome the foremaist European-settlt pairt o that kintra. He wis frae Saint-Malo, Fraunce, born in the year 1491 tae a weel-respeckit faimlie o marinars. He bettered his social status in 1520 bi mairryin Catherine des Granches, member o a leadin gailley-ainin faimlie. His guid name in Saint-Malo is recognisit bi its monie appearances in baptismal registers as godfaither or witness. Jacques Cartier wis the first European tae descrive an cairt the Gulf o Saunt Lawrence an the shores o the Saunt Lawrence River, whilk he named "The Kintra o Canadas", efter the Iroquois names for the twa big settlements he saw at Stadacona (Quebec Ceety) an at Hochelaga (Montreal Island). The Keeng o Fraunce, François I, chuist him tae find "certaines îles et pays où l'on dit qu'il se doit trouver grande quantité d'or et autres riches choses" ("certaint inchs an launds whaur it is quo thare are muckle quantities o gowd an ither riches"). In 1534 he setten sail leukin for a wastren passage tae Asie. He sploret pairts o whit are the nou cried Newfoundland (stairtin on Mey 10 o that year) an the Canadian Maritimes an whaur he learnt o a river forder wast (the St. Lawrence River) that he believed micht be the fair rakit-for northwest passage. The directions o the first vaige o Jacques Cartier, the name o the places he foond, aw in Scots. He landed for the first time at praisent day Gaspé, Quebec whaur he plauntit a cross an claimet the territory for Fraunce. Owre this vaige he teuk Domagaya an Taignoagny, the sons o Huron Heidsman Donnacona, back tae Europe. Cartier setten sail on a seicont vaige on Mey 19 o the follaein year wi 3 gailey, 110 men, an the twa fremmit lads (wha wis returned tae the Heidsman). He sailed up the river for the first time an reached the steid o praisent-day Québec Ceity, hame o the Huron clachan o Stadacona whaur Donnacona wis reunitit wi his twa sons. Cartier left his main gaileys in a herbour naur tae Stadacona an uised his smallest gailey tae conteena upriver tae veesit Hochelaga (Montreal) an arrived on October 2, 1535. Hantle mair impressive than the smaa an fousome clachan o Stadacona, mair nor a thoosand Huron came tae the edge o the river tae greet the Frenchmen. The site o thair income haes been confidently identified as the beginnin o the Sainte-Marie sault, a location whaur the Jacques Cartier Brig nou stands. Efter spendin twa day amang the Hurons o Hochelaga, Cartier returned tae Stadacona on October 11. It is no ken preceese whan Cartier decidit tae spend the winter o 1535-1536 in Canadae but the decision buist hae been makkit bi his income in Stadacona as it wis bi than owre ahint the haund tae return tae Fraunce. Cartier an his men prepared for winter bi strengthenin thair fort, hainin inglewid an sautin doun gemme an fish. In throu that winter, Cartier compiled a kynd o gazetteer whilk includet several pages on the mainer o the natives, in parteecular thair prattick o wearing anerly leggings an moccasins e'en in the deid o winter. Frae mid-November 1535 tae mid-Apryle 1536 the French fleet lay frozen solit at the gab o the St. Charles river, ablo the Rock o Quebec. Ice wis owre twa faddom thick in the river an snaw fower fit deep ashore. Tae add tae the discomfort, scurbie broke oot, first amang the Hurons an than amang the French. Bi mid-Februar, Cartier states that "oot o 110 that we wis, no ten wis weel eneuch tae help the ithers, a thing peetifu tae see". Cartier estimates the coont o Hurons deid at 50. Ane o the natives that survived wis Domagaya hou haed been taen tae Europe bi Cartier the year afore. He visited the French fort for a freendly ca, Cartier enquired an learnt o him that a concoction makkit frae a certaint tree cawet annedda wad cuir scurbie. Thon remeed probably sauft the expedeetion frae destruction an bi the end o the winter, 85 Frenchmen wis alive. Ready tae sail back tae Fraunce in early Mey 1536, Cartier decidit tae kidnap Donnacona sae that he micht personally spin the tale o a kintra further north, cawet Saguenay, that wis quoet tae be fou o gowd, rubies an ither treisurs. Efter a arduous Vaige doun the St. Lawrence river an a three week Atlantic crossin, Cartier an his men arrived in Saint-Malo on Julie 15 1536. That is hou the secoint an maist profitable o Cartier's vaiges endet, lestin fowerteen month. Haein awready locate the entrance, he nou opened up the greatest watterwey fae penetratin North Americae. He haed makkit an mensefu estimate o the resoorces o Canadae, baith naitral an human, mauger considerable exaggeration on the meeneral side. While some o his actions wi respect tae the natives wis dishonorable, he did his best tae staiblish freindship wi the Huron up an doun the Great River, an indispensable preliminary tae French Hame. On Mey 23, 1541 Cartier depairtit Saunt-Malo on his thrid vaige wi five gailey. This time, ony thochts o finnin a passage tae the Orient wis forgotten an the goal wis tae fin the Kinrick o Saguenay an its riches an an wa tae establish a permanent Hame alenth the Saunt Lawrence River. Anchorin at Stadacona on Augist 23 1541, Cartier met the Hurons but foond thair "shaw o joy" an thair nummers worrisome an decidit no tae big his Hame thare. Sailin nine mile up the river tae a spot he haed observed aforehaun, he decidit tae settle on the site o praisent day Cap-Rouge. The convicts an ither colonists wis laundit, the nowt whilk haed survived three month aboard gailey wis turnt lowse, earth brucken fae a kitchen gairden an seeds o kail, turmit an lettuce wis plauntit. A fortified hame wis sicwice shapit whilk wis named Charlesbourg-Ryal. Anither fort wis biggit on the falaise owerleukin the hame fas addit pertection. The men begoud collectin cou-leddy-stane creestal ("diamonds") an airn pyrites ("gowd") an aw. Twa o the gaileys wis dispatched hame wi some meenerals on September 2. Haein set tasks for awbodie, Cartier left wi the longboats for a reconnaissance o the Saguenay on 7t September. Haein reakit Hochelaga, bad wather an the numerous rapids preventit him tae conteena up tae the Ottawa river. Returnin tae Charlesbourg-Royal, Cartier fins the situation uncannie. The Hurons nae langer makkit friendly veesits or peddled fish an gemme, but prowled aboot in a sinister manner. Nae records exists aboot the winter o 1541-1542 an the information maun be gleaned fae the few details providit frae returnin sailors. It seems that the Indians attackit an killt aboot 35 settlers afore the Frenchmen coud retreat ahint the fortifications. Een tho scurbie wis cuiret throu the native remedee, the impression left is o a general meeserie an o Cartier's growin conviction that he haed insufficient manpower baith tae pertect his base an tae gae in sairch o Saguenay. In early Juin 1542 awbodie boardit the three remainin ships for tae gae hame. Thay arrived back in Europe in October o 1542. Cartier spent the lave o his life in Saunt-Malo an his naur aboots estate, an deed aged 66 on September 1 1557 frae an epidemic. He deed afore ony permanent European Hames wis makkit in Canadae; that haed tae wait for Samuel de Champlain in 1608. ↑ His cairts are lost but referenced in a letter bi his nephew Jacques Noël, dated 1587 an printit bi Richard Hakluyt wi the Relation o Cartier's third voyage, in The Principall Navigations [...], London, G. Bishop, 1600. ↑ "Exploration — Jacques Cartier". The Historica Dominion Institute. Retrieved 2009-11-09. Wikimedia Commons haes media relatit tae Jacques Cartier.